E-commerce firm Mjunction Services Ltd is hunting for acquisitions in Europe this year for its flagship portal Buyjunction.in and also seeking strategic investors for all its portals. 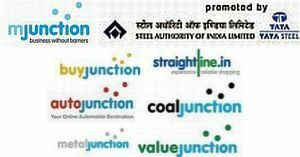 Mjunction Services, a 50:50 e-commerce joint venture between steel makers SAIL and Tata Steel, has zeroed in on two targets for acquisitions in Europe and is also looking to induct investors for its portals to scale up operations, a top company executive told Techcircle.in. The decade-old firm, which runs seven online businesses, has recorded e-transactions worth over Rs 90,000 crore ($20 billion) across its businesses over the last 10 years of operations, making it one of the largest B2B e-commerce operators in India. Of its 111 clients, around 60 per cent belong to Buyjunction.in, an online sourcing site aimed at businesses. Mjunction is targeting e-sourcing and e-procurement companies in Europe and is in talks with two such companies at present, according to Viresh Oberoi, managing director of mjunction Services Ltd. Although he declined to name the target firms, Oberoi said, "We are looking at a strategic fit. These are large companies which are also into other activities and we will have to look at the synergies in detail. We will close the deals by the year-end." Elaborating on the reason for choosing Europe to expand, Oberoi said, "We are already working with Tata Steel in the UK and have acquired a considerable amount of knowledge. And we are comfortable with that market. We are expanding to get more clients in Europe and specifically in the UK. We also expect to learn more about procurement best practices in the new markets with our buys." Besides overseas acquisitions, the firm is also on the lookout for strategic investors for each of its portals for scaling those up. "We are interested in strategic investors to bring in more than just money," Oberoi said, adding that the promoters were attending to all capital requirements. Mjunction may also consider hiving off some websites in the future into separate companies, depending on the uptake of e-commerce in India. Mjunction offers online auction services for steel, coal, ferrous and non-ferrous metals, mixed assets and scrap, chemicals and automobiles, and also operates a B2C online shopping platform in India. Mjunction handled transaction value of Rs 24,854 crore in FY11 and expects to reach Rs 35,000 crore in FY12, according to Oberoi. Mjunction runs a multitude of e-commerce portals and here is a look at their current status. Buyjunction.in: It is the sourcing unit of mjunction. This B2B site uses reverse auctions to source products and services for clients. It has mostly Indian clients on board such as Aditya Birla Insulators, Emami India Ltd, Berger Paints, Jindal Steel and Power Ltd and Genpact. It also offers a range of services such as assisted sourcing with domain experts and advisors, group buying and an in-house developed e-procurement platform that integrates with ERP and SRM applications. It also runs a call centre with 29 employees. In India, one of its largest orders was for the Ministry of Defence and was worth Rs 13.22 crore. It involved procurement of goods and services for over 50 locations and when fully commissioned, will cater to 20,000 vendors and service 1 lakh tenders every year. Buyjunction also has three international clients, Oberoi said. It is registering 60 per cent growth on an annual basis and this growth is expected to continue for the next two years. "At Buyjunction, we believe that the provision of a state-of-the-art and comprehensive sourcing solution can transform the procurement process and enable it to reach its full potential. Buyjunction provides multiple IT & Internet-based solutions to solve the most difficult sourcing and procurement problems and help the purchasing operations of client organisations leverage a newly found competitive advantage," said Oberoi. Buyjunction's current valuation stands at Rs 800 crore, according to a company presentation. Straightline.in: It's a typical consumer goods-focused e-commerce site, with categories such as consumer electronics, apparel, home and kitchen appliances, mobile phones, games, jewellery, luggage and travel, books and CDs etc. It also offers corporate gifting solutions. The website has tie-ups with ICICI Bank, Citibank and BillDesk for online payment, and has partnered with Drive India Enterprise Solution Ltd for logistics. The B2C retail site was launched in October, 2009, and is still in investment mode. It is still "extremely early days" for the website, according to Oberoi. Discussing traction on the website, Oberoi said, "It's not earth-shattering. The issue is more about lack of internet infrastructure and the mindset of trusting online transactions. In fact, a very small percentage of people are buying online today. Besides flight and train tickets, the number of people buying consumer goods is small and item values are also small. So we believe that it will not take off for the next 3-4 years. Our next engine of growth for five years is Buyjunction but after that, it will be Straightline. Straightline.in will grow 300 per cent year on year." Straightline.in will now expand its reach into tier II and tier III cities. Autojunction.in: An automobile e-commerce site launched in 2006. It also offers online booking of test drives, reviews, national and international news on automobiles, an affordability calculator, personalised car buying suggestions and loan and insurance quotes. In 2010, it partnered with electric scooter manufacturer YoBykes to sell two-wheelers on the site. Next, Autojunction.in will expand to cater to B2B, B2C and C2C audience and deliver specialised auto services such as eAuction, eClassifieds, eRetailing and eReferral services, according to the company. Coaljunction.in: Aimed at the coal buying community, it currently conducts online sales on behalf of Coal India Limited (CIL) and its subsidiaries. Going forward, it intends to develop other revenue sources and build up more capabilities for sale of imported coal and coal rejects and post-sales management services. Valuejunction.in: It helps in disposal of idle capital assets such as transport tanks, drum-conveyer belts, cables and machinery. It is also based on the auction model. Valuejunction.in has conducted online auctions of 335 repossessed properties in 41 cities across India. Metaljunction: It is the company's business unit for ferrous space and steel. The company also claims that it is currently the largest electronic steel marketplace and is selling 2 million tonnes of steel per annum. So far, it has sold 8 million tonnes of steel. Junction.co.in: A platform for bidding, buying and selling metals and minerals.